Galveston Seawall a major engineering feat. And one cool Marine Drive. What do you do when your 44 square mile island is only 8 1/2 feet high? The Galveston Seawall. Could a Galveston Seawall be the key? When its people were devastated by the Great hurricane ? When some survivors said "we felt like we were in a bowel and water was starting to flow over the top onto us"? The Islanders changed the topography of the island. A seawall had been considered for some time. Now it got built. They build the Seawall. Then using jack screws elevated thousands of houses, churches, and buildings. With that done. They elevated the island beneath 500 city blocks with buildings! After the Galveston Hurricane of 1900 the Island reeled from staggering losses. Strangely enough, one phenomena of the storm made the case for a Galveston Seawall. As the storm surge and waves destroyed potions of the island debris piled up. At one point the debris created a type seawall. This barrier protected many buildings behind it from ruin. In the late 1800's, larger ships came into service. Being larger and heavier they required deeper ports. Galveston had an ever increasing problem with silting and sandbars. The ships loading and unloading in Galveston, had to anchor away from the docks. Then smaller boats would shuttle loads back and forth. This was time consuming and expensive. Plus there was always the Rail Road that could siphon off business. When news that New Orleans was becoming a deep water port, Island leaders were galvanized into action. Lead by, Colonel Moody the Deep Water Committee was formed. After years of work and financing in 1896 the port's depth increased from 8 feet to 27 feet. DWC's, Engineers, the creative, technical minds behind the Seawall. After the Great Hurricane of 1900, the Deep Water Committee once again took control. The committee appointed three engineers. One retired engineer, Henry M Robert, had deepened Galveston Harbor. Alfred Noble, an engineer from Chicago and, H.C. Riply who designed the Wagon Bridge from Galveston to the mainland. The engineers developed a plan. It would protect Galveston from future cataclysm. It required a wall to be constructed. Pilings were to be driven 40 feet below sea level, securing its foundation. The side facing the Gulf would be curved, or concave. This would reflect incoming storm surges and wave action back into itself. It would rise 17 feet above sea level. The base would be 16 feet wide and taper to 5 feet at the top. Initially it would span 1 mile of the Island coast. Extending 27 feet into the surf, were granite boulders. These would reduce the intensity of wave action. Additionally it would protect the seawall's foundation from being undermined. 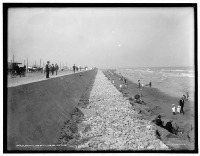 The first phase of the Galveston Seawall started Oct. 7, 1902. This initial 1 mile was completed in October 1905. The wall continued being built in segments. Over the next fifty five years the seawall grew to over ten miles, one third of the Galveston coastline. Galveston Seawall and return to Galveston Attractions To accomplish this feat required every: house, school, church, temple, and store - every building to be raised using jack screws. Every street, sidewalk, sewer, water line, drain, gas lines, and trees in a five hundred block area had to be elevated. Even cemeteries! We have to remember this was done before diesel equipment, before hydraulic excavators. Galveston, the Come Back Queen. 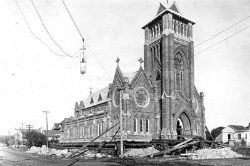 By 1911, over 2100 structures had been elevated. Then over 16 million cubic yards of material were used to elevate the Island behind the Galveston Seawall. In 1911, Galveston was steaming ahead. Only two cities in the United States shipped more exports: New York, and New Orleans. But by 1912 Galveston eclipsed New Orleans exports, and moved to #2 in output! The Galveston Seawall provided a bulwark against the worst the Gulf of Mexico could hurl. 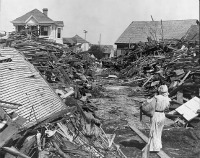 In 1915 a storm of greater magnitude than the Storm of 1900 struck Galveston. While this monster raged. The patrons of the Hotel Galvez wined, dined, and danced the night away in safety. Galveston, "The Come Back Queen" was back. Return to Galveston Travel and Charm Homepage.